In June this year my beloved Staffie cross died at age 13 years old after a short illness. He was feisty, loyal, unpredictable and had aggression issues, disliking many people and other animals in equal measure. One of several dog behaviourists we hired to help him uttered the immortal words “this dog is not a monster” this was about 30 seconds before Dylan bit him! Not his finest hour and I cried for days wondering why I had ended up with the Hannibal Lecter of the dog world. 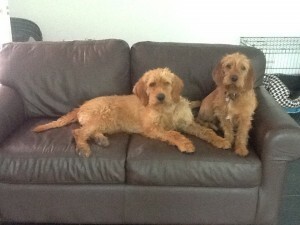 So, his passing was a mixed blessing and I had no intention of getting another dog….. I had enough on my plate already, part of me saying we still had Ruby, a Braque Allemande cross and chasse reject, adopted from my local SPA 5 years ago, who is skittish and terrified of gunshots and then there are our two elderly cats, a rabbit and various poultry, but then the other part of me kept nagging “but there is a bit of room left at the Inn”(and clearly I am the sort who would have turned Mary and Joseph away but found a room for the donkey)! So via the internet I found the SPA Carcassonne site, our local SPA doesn’t have one, and doesn’t extend a particularly warm welcome even to those wanting to adopt a dog and I was immediately drawn in by the warmth of the welcome and how well the site was presented, showing a lovely complicity between the staff and the dogs. I started to check the site regularly to get updates on adoptions and arrivals and shared in the triumphs and disappointments. I felt that the photos and the snapshots of the dogs characters, with a bit of the dog’s history wherever possible, was a great starting point. And then I saw him, Pitchou, a scruffy, hairy, mutt of 8 years old, abandoned due to a divorce by people who had had him from a puppy. Boy did that story resonate with me and pulled me straight back to my childhood. When my parents divorced Imm not sure either were that keen on keeping the children so the dog stood no chance and I got home from school to a dogless house to be told that the dog had been sent to a farm! “But what does a sausage dog do on a farm we wailed”, “nips the cows heels to round them up into the sheds”, came the reply. Game Over for poor Simon and it was not the poor dogs fault! This put me on Pitchou’s ‘side’ from the start and in the SPA write up the word SOCIABLE leapt out at me, he was good with other dogs and very laid back. This really was music to my ear and it all sounded too good to be true, but I figured that as the same family had had him for 8 years then he most likely was just that! I made further enquiries by phone and e.mail and the lovely Moira was always on hand to answer my queries and offer good help and advice. I loved the fact that she was never pushy and just let me make decisions and ruminate at my own pace. In some ways having had Dylan I was a bit afraid of taking on a new dog and may have been trying to put obstacles in my own way! The big test however, and non negotiable, was whether Pitchou was good with cats, so Moira organised a cat test and I was assured that he was totally disinterested in any feline charms! It was important that the whole family were on board with the adoption so the 4 of us set off together on a roasting hot July day to meet our new chum. Pitchou, despite having had a recent wash and brush up by Moira, still looked rather bedraggled but was an instant hit with my husband who wanted to rush out and get him a dog-kerchief and rename him Banjo (..err..No!) My younger daughter waxed lyrical about hairstyles, bobbles and grooming so I tried to remain objective and calm so that I would be strong enough to say ‘no’ if necessary. We took him out of his kennel and into one of the little parks and that is when he dropped his ‘little old man act’ and showed his true colours racing around, bounding up and down, flinging his kong ball everywhere and jumping in and out of a bowl of water, he couldn’t have done more to attract attention if he had started high kicking with a cane and top hat! It was almost like he knew it was a now or never moment and the deal was done! So he was reserved and taken for all his jabs and to be snipped and he was collected in August! Well what can I say, from day one he has been simply wonderful and has settled in beautifully. He is friendly, funny, gentle and has clearly been well trained as he knows all the basic commands, walks well on the lead, has excellent recall and has not tried to sit on the furniture. He even snores very sweetly so, what’s not to like!! He and Ruby rub along well together though her nose was put out of joint to start with and she was very ‘ice maiden’ for the first few weeks, considering herself to be Yves St Laurent to his Primark, but his steadiness of character has won her over. A real case of Lady and The Tramp! He has been to my local vet for a meet and greet and behaved impeccably. He is lively but not demanding and loves to walk, but then I’d never thought of him as being ‘old’ at 8, because he isn’t and as the vet said “He is a flower who has just opened”…aaah…sweet! All he needed was a bit of kindness and a second chance and we consider ourselves enormously fortunate to have found him. Short-term fostering is needed from time to time for a number of reasons. A dog may be recovering from surgery or illness and need a quiet place to convalesce, or just need somewhere to stay while waiting to be collected by his adopter. The SPA is a haven for many dogs that have been found wandering and alone, but for others it is just too traumatic and confusing and not the best place to be. A dog who stops eating or just cries all the time will not be at his best when people come looking for a dog so a foster home can help to lift his spirits and get him ready for his new life. My story began with an adoption and then changed direction somewhat. 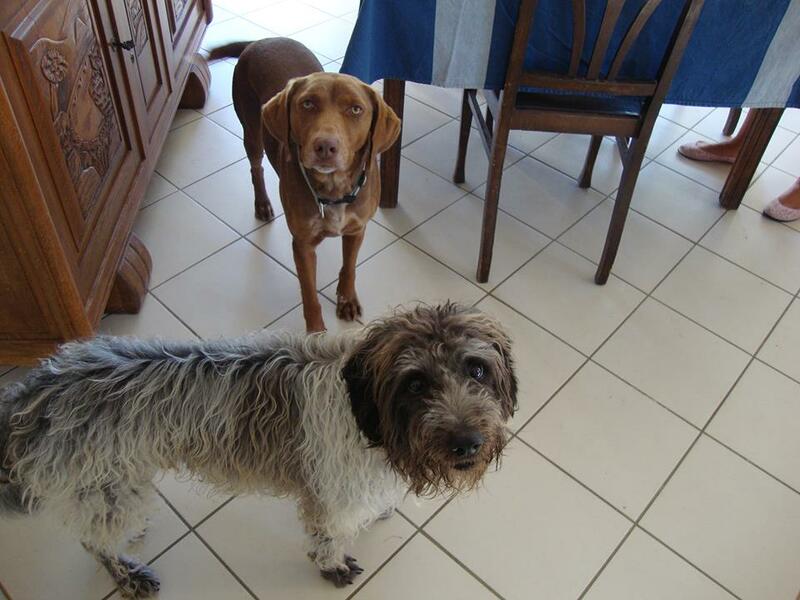 A while ago I adopted a little ex-chasse Fauve from the refuge who had been found thin and dirty, wandering around a village in the Corbières. It turned out he was about ten years old with quite a number of health problems but he cleaned up well and was a happy little soul, loved his food, his cushion on the settee and adored to be out walking. We had quite a few worrying incidents and trips to the vet which didn’t seem too bad at first but unfortunately after only three months his lumbar vertebrae collapsed completely and he was in such pain with no hope of recovery that the vet and I made the only decision we could. I cried for days. He’d touched my heart so much. After a couple of months I decided to offer to do some fostering for the refuge which would keep me in contact with dogs but without the total commitment (and heartache) of ownership. Toufu was our first foster dog. He had been attacked by 2 errant Doberman dogs and lost a very large lump of his thigh. The initial choices in the town where he was picked up by the police were either to put him to sleep or to amputate his leg. But the SPA vet did a wonderful job to save him and so he began the long weeks of recovery to get skin to grow across the raw wound. He came to us when the circle of bare flesh was still almost 4 cm across and he wore a permanent lampshade collar to stop him licking it. With a daily application of ointment the wound slowly covered over with new skin and after seven weeks he was ready to leave for his new home in the Lot, being made a fuss of by the children on the campsite where he now lives with the owners. Tilly came next while she waited for her new family to come from the UK to pick her up. She arrived straight from the vet after her spaying operation and a spot-on treatment for me to give her next morning as they had discovered she had ticks – the sort that reproduce and multiply on the dog. (Well I hadn’t heard of them either!!) Apparently her new cell-mate had brought them in and both dogs being very shaggy they were difficult to spot while they were spreading. I spent the next few days picking off hundreds of “plombs”, no exaggeration, still alive 3 days after the spot-on treatment. Fortunately Tilly loved being groomed and just lay there while I picked them off and dropped them into a jar of water. 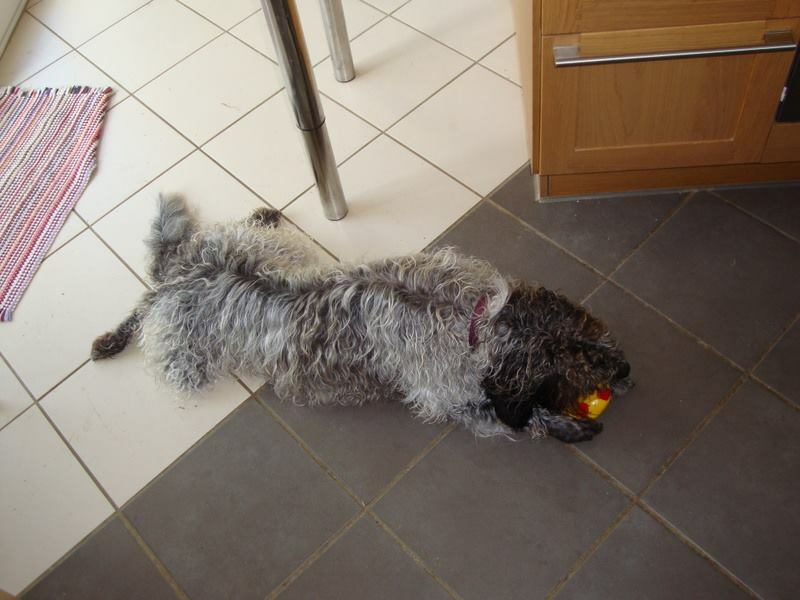 The beautiful, quiet, unassuming Tilly now lives in the south of England with her new doggy pals and a doting owner. Next we had Tim, who was very upset at being in the refuge and was going downhill fast. He had been abandoned by his owners (after 8 years of family life) because of a house move or divorce or something. He seemed to have given up and just cried all the time in his pen. He proved to be intelligent and obedient and a pleasure to have and was soon enjoying life again. We only had him for 3 weeks when he was spotted on dog:links and was adopted by a lovely couple from the Vendee and now he is the happy companion of their 2 Labradors. Perdita, a dainty little whippet cross was also very distressed at the refuge and had stopped eating. She cried every time she heard a car pull away and they think she must have been driven some distance away from home and dumped as they drove off without her. She was lovely, no bother at all. She soon got her appetite back and became a loving companion. a good little watch-dog and brilliant at catching flies. We had her for about seven weeks and now she lives near the sea in the Charente-Maritime. During her time with us Othello (a handsome border collie cross) came to join us. He proved to be just the perfect dog for us and we decided to keep him so now Tello is ours. He gets on with everyone and loves having doggy friends to stay which means we can carry on fostering. He really missed Perdita when she left us but he loved Alexia just as much when she came along. The tiny setter cross of eleven months had obviously never lived in a house, but had probably spent her days in a pen with other chasse dogs, so she needed house-training. She was very intelligent and eager to please and was quite a character. She was with us for two months before going to another foster family when we went on holiday. She had a wonderful time there and now has a permanent home in the UK with a young family who adore her. At the moment we are looking after Titou, a seven months old Labrador cross who just needs a safe place to stay for a while. He is going to be a big handsome boy and so well mannered and obedient. He’s a joy to have around. He adores water. He is doing his best to get Tello to swim instead of just splashing about in the shallows but they have a great time together whatever they are doing. 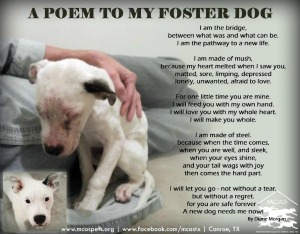 If anyone out there is thinking of fostering I can recommend it. It’s not as tying as owning a dog if you are away a lot, and by using the SPA vet there are no vet bills to pay. You will have a canine companion to talk to and get you out walking every day. AND you will be performing a very worth-while service. You can answer questions from prospective adopters truthfully to help them decide on the right dog for them. Dogs do not behave in concrete boxes as they would in a house so home-life experience is a great step to a permanent family. Let’s face it you can never be sure what you are getting when you adopt a rescue dog. (Tello has the intelligence of a border collie and the calm, gentle good nature of a lab. There are probably a few more breeds in the mix as well but whatever they are they have worked brilliantly.) The same goes for most rescue dogs. They are a real mixture and remain a mystery until you get to know them away from the refuge. People have said to me “I don’t know how you do it. How can you bear to part with them when the time comes.” Of course there are a few pangs when I say goodbye, a lump in the throat every time, but there is pleasure and a bit of pride too as I wave them off to start the rest of their lives. (A bit like when your small child starts school and you realise it’s the end of something special but the beginning of something bigger). I do worry until I hear they have settled okay though, and emails and photos about their progress are always welcome. But this poem says it all really! I’m writing this from bed where I am currently held captive by the hound lying across my feet. Every now and then he stirs and stretches, wagging his tail in his sleep. It feels entirely beyond my comprehension that anyone could have given up this loving, dopey creature, who doesn’t have a malicious bone in his body (he has dozens of goofy, clumsy bones, but no bad ones), and even harder to believe that he was nervous of all of us only 8 weeks ago. Munro came to us from the amazing SPA Carcassonne, who are, like so many shelters, utterly overrun, dependent on donations from and adoptions by the public. The comment we get most often when introducing him to people is “but WHO would give up a handsome chap like this?” The answer is a farmer/hunter, for whom Munro’s 3 second attention span was no use following a scent. He is a Griffon Fauve de Bretagne, a beautiful Labrador sized hound bred to hunt wild boar. And in France, if a working dog won’t work, then he’s pointless. Also the French seem not to be keen on adopting dogs bred for working. So his chances of being chosen for adoption from the SPA were negligible. He came to our attention through the Fauve rescue facebook page, we already have a Bassett Fauve, Minnie, who we have had since a pup, we fell in love with the breed and despite a couple of less than adorable characteristics (scent hounds are not particularly reliable off-lead, you need securely fenced garden space and be prepared to give them plenty of exercise), I think it’s likely to be life long commitment to the type. 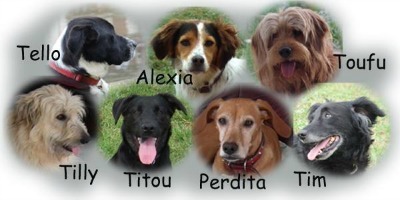 They are absolutely charming dogs, full of joy and personality, and very loving. They are comical to watch at play and a joy to walk and run with, we have never yet had a walk with Minnie in the 16 months we’ve had her where we haven’t been stopped by someone asking “what IS she?” Because she doesn’t look like anything else. The truth is that both that Bassett and the Griffon Fauve are relatively common in France but still very unusual here. There are waiting lists with good breeders in the UK, but they often turn up at rescue centres across France when they still have plenty of life left and love to give. As our breeder was told when enquiring about life expectancy amongst the working French pack she was adding to her kennel from “they live until they can’t hunt”, but most Fauves have a good 14 years in them. Since Munro came to live with us we are stopped twice as often, they make a very attractive pair, and people fall in love quickly. I’m seriously thinking of having business cards printed with the details of the breed and the Facebook page, having written it down on so many scraps of paper for people who stop us. Our experience adopting from the SPA was very much more straightforward than adopting from the british equivalent, which we have done previously, it feels as if the staff take a very pragmatic view, it is obviously important that you offer a safe and happy home for the cat or dog you adopt, but the emphasis is on having the right attitude, not just the right boxes ticked, which makes a refreshing change. Also they were totally up front about what the potential challenges would be, they are are realistic because the last thing they want is to have the animal returned if the match isn’t successful. We were lucky enough to have references from Minnie’s breeder, who is well respected in the fauve community, so once I’d seen Munro’s photo and fallen head over heels, I had a conversation with the SPA’s indefatigable director, Darcey. She told me everything they knew about him, and explained the adoption process, then on to the logistics. We were fortunate in that Moira, another SPA volunteer was crossing the Channel en route to Scotland, and was happy for him to travel with her and her dogs. We had back up ready from the Fauve Rescue group, in case he and Minnie didn’t click and we couldn’t take him, so we drove from Somerset to Folkestone motorway services with our hearts in our mouths. Luckily, they adored each other from the off, they are devoted playmates, chasing and tumbling for hours and are often found lying together asleep when they’ve worn each other out. Adopting a rescue animal is always a little bit of a leap into the unknown, but I firmly believe that if you have enough time and energy to give a puppy then you have enough of both for a rescue dog. There are very few dogs who are beyond learning different behaviour and it really only takes consistency, kindness and patience to make a nervous animal a happy and confident one. We have benefitted greatly from a few 1:1 sessions from our local dog behaviour expert, who gave us simple tricks and tips to help build a bond quickly and taught us to reward positive behaviour whilst ignoring the negatives. This has been well worth the £20 per hour, one session was enough to get us off to a good start, and we’ve had lots of homework to practice before we see him again. So often you need someone external, with no emotional attachment, to show you the right way to deal with a situation, I will be grateful forever to Adam, he turned the situation from us feeling a little overwhelmed and unsure how best to manage Munro’s panic to one where we had an agreed response to any behaviour. It’s very similar to raising toddlers, you must be consistent with any behaviours you don’t want to encourage, and like toddlers, dogs don’t understand “sometimes”, they understand “yes” or “no”, so boundaries really matter. Munro has changed from a dog who slept curled up tightly in a ball with one eye open, to the confident creature who sleeps sprawled out wherever he fancies (often on his back with all four legs in the air! )He has rewarded our patience with devotion and has learnt so quickly he has astonished us. Having never lived in a house he picked it up fast, often copying Minnie when unsure. He practically toilet trained himself in the space of 48 hours, all we had to do was offer him the opportunity to go outside frequently, with wild praise and lavish affection when he got it right, he is so keen to please. His recall skills are brilliant, he comes happily every time I ask, and he will sit, lie down, fetch, drop, leave and offer a paw. We are working on “wait”, but he’s settled very quickly into his surroundings here and also seems delighted with every new experience, he loves going into town, to the beach, to the forests and trails and meeting people, though he is wary if we meet walkers going in the opposite direction, but is reassured quite easily and he will sit quietly under our table of we stop for coffee or lunch. He is wonderful with children, very gentle, and has lovely “pack manners” so fits in nicely with Minnie’s family, where he will stay with her when we go on holiday later in the year. He has a typical hounds relentlessly hopeful friendliness, he is baffled if other dogs don’t want to play. He loves to run with Minnie and I, and is so full of utter joy when he plays with her or by himself, he throws his own ball, then chases it wildly, he also loves to play retrieve games but is rubbish at catching. It feels incredible that 8 weeks ago, we didn’t know him, and now he’s so much part of the family that we almost can’t remember life without him. Our dog trainer says that the worst thing you can do for a rescue dog is feel sorry for them, as you mustn’t excuse any behaviour you don’t want to encourage. It is hard though, not to feel sad that he could still be at the SPA if he hadn’t come to our attention, just because of his working past, the SPA has many wonderfully devoted volunteers, but they always need more and cannot possibly give each animal the attention they could have in a forever home. It has been an effort to be consistent, but definitely no more than with a puppy (and much less messy!) and I can truly say he becomes a happier dog every day. Seeing how Munro has blossomed I am more confident than ever that nearly every rescue dog has the potential to be a wonderfully rewarding pet with the right handling. All Munro needed was time, firm boundaries and a lot of affection. When he came to us, he would tolerate affection but didn’t seek it out, now he is the cuddliest dog imaginable. There must be dozens of British ex-pats living in the gorgeous surroundings of the South of France, which means there must be lots of potential homes for dogs like Munro. There are dogs of all ages and dispositions at the SPA, so please don’t assume that the pet shaped hole in your life can’t be filled by an animal who is already alive and waiting for you to find them. If you can’t adopt an animal at the moment but you have time or expertise to spare then why not join the volunteer force who keep the SPA afloat?